It was a bright sunny day in Oklahoma when suddenly a massive 100 foot flame shot out of the side of the rig I was approaching like a giant fire-breathing dragon. The sound of the fireball was unmistakable even though the air conditioning was on and the car windows were rolled up. I was still too far away but I could almost feel the heat radiate through the windshield. I had been on a lot of rigs in my early career and expected to see chaos and people running around trying to control the well that was clearly out of control. However, as I timidly pulled into the graveled area and parked as far away from the rig as possible, I saw no chaos, it was business as usual. I waited for the flame to die down before I shut off the engine and opened the car door. As soon as I stood in the parking area, I was approached by a tall man that looked like he hadn’t shaven or slept in the past few days. “Are you the geologist”, he inquired. I confirmed that I was and we exchanged introductions, finding out that he was the company man. Thinking back on what I just saw as I drove in, I could only smile weakly and try to imagine what it was like “a few hours ago”. I also made a mental note that when this conversation was over to move the car so it was parked heading out. Turning a car around can waste precious seconds – seconds I would much rather spend looking in the rearview mirror…just in case. I was a bit early. I was there to supervise the logging job and to bring the logs back to Oklahoma City. I was now thinking coming a bit early wasn’t such a good idea but I always enjoyed hanging around the rig and meeting the various “personalities” that only the oil industry has the ability to attract. When the Schlumberger engineer arrived to begin logging, the well gave one final belch as flames shot across the mud pits. He was as nervous as a turkey the week before Christmas. He had just come from a well about 20 miles away that actually did blowout so perhaps his nerves were a bit justified. However, as for myself, I was was now accustomed to it and wishing I had brought my camera. The overpressured gas plays in the Anadarko basin are just one of the small items that has made the Oklahoma oil field the legend that it is today. The western Anadarko basin wasn’t really the prime oil and gas area of Oklahoma until the boom in the 1970’s. Oil production was higher on the shelf in eastern Oklahoma and extended to the central part of Oklahoma. The Anadarko basin is productive from a multitude of formations, including, Tonkawa, Cottage Grove, Oswego, Red Fork, Morrow/Springer, Chester, Mississippian, Hunton/Woodford, Granite Wash and probably a few others that I have missed. The plays are structural, stratigraphic, post-depositional and combinations of everything. The Anadarko is a giant geologic puzzle that shows itself one borehole at a time and usually has a surprise or two along the way. It is important for the geologist to understand the pre-depositional topology, depositional regimes, post depositional factors including hydrocarbon source, hydrocarbon migration, water migration, clay mineralogy and a host of other factors. The basin has a particularly thick section of Pennsylvanian rocks which is a prolific oil and gas producer. The basic northwest trend of the Anadarko feature is at least as old as Middle Proterozoic (about 1.4 billion years ago). From the Middle Proterozoic until the Mississippian the Anadarko basin (and much of the southern mid-continent) was inundated by a broad continental sea. 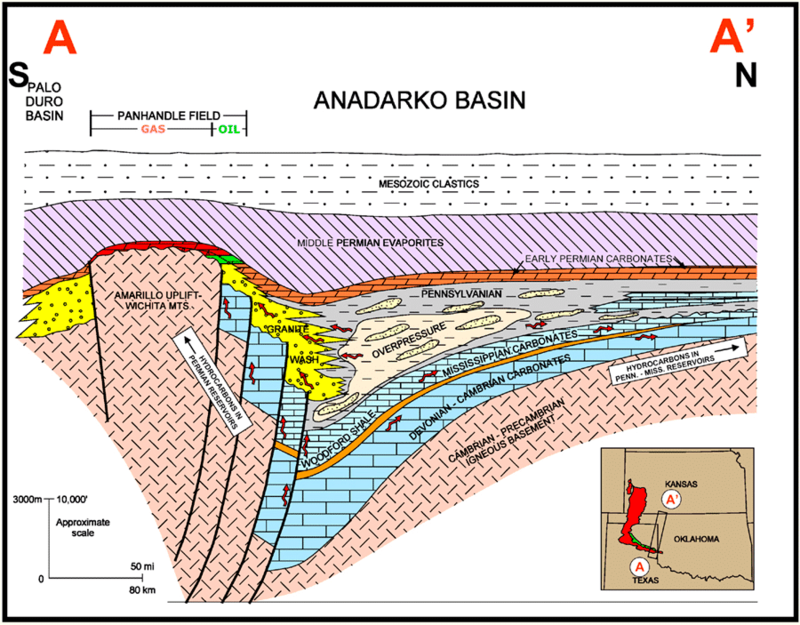 During that time thick sequences of limestones, sandstones and organic rich shales were laid down in the Anadarko. In the Mississippian – Permian time the Wichita and Arbuckle Mountains were uplifted resulting in thrust faults that have up to 40,000 feet of displacement. This essentially defined the basin morphology as it today. There are 3 interesting formations now being played in the Anadarko – the Woodford shale, Mississippian Lime and the Morrow/Springer Shale. The Woodford is a rich organic black shale that is late Devonian and early Mississippian in age. It has been widely regarded as a major hydrocarbon source rock for the basin. If you divide it into the lower, middle and upper, the upper thickens to the northeast towards Kansas and the lower and middle thicken to the southwest into the center part of the basin. The three units also have TOC which is unique to their deposition. The Springer shale is above the Woodford and is Mississippian in age. Unlike the Woodford the Springer is actually a mix of sandstone and shale (there are other “shales” currently under development that are also mixed with sandstone or limestone and are probably not technically a shale). As a result of it’s composition it is estimated that the Springer will have higher porosity and permeability than a typical shale play. The industry is also hopeful that as a result, it won’t have the typical sharp production decline curve that is typical with a shale. Time will tell if the industry hopefuls are correct. The other interesting thing about the Springer is that many believe its source of hydrocarbons comes from the Woodford. The Mississippian Lime has been a petroleum target in the Anadarko for a very long time (since the 1940’s). I seem to recall drilling at least one well into this tight limestone back in the early 1980’s. It never seemed to produce well but if you were looking for a bailout zone, the Mississippian Lime was definitely the place to look. Today, with horizontal technology it can be produced economically as the target formation. It produces water which needs to be disposed of but the drilling costs are substantially cheaper than an Eagle Ford or Bakken well. The wells are shallower and because the lime is porous and easier to drill they are often less than half the cost of a conventional shale well ($3-$4 million versus $8-$10 million). As of this writing (Dec 2, 2014) there are currently 240 active rigs in Oklahoma with 218 of them permitted as horizontal wells. It is clear from the rig locations in the map below, the shale plays in Oklahoma are not just focused on the areas that seem to be getting the most attention but are scattered across the western half of the state. It is the second most active state in the US (behind Texas) but if you look at the number of rigs per square mile, Oklahoma edges out Texas as being the most active area in the US. As of this writing Sandridge has 31 rigs operating in Oklahoma, Continental Resources – 25, Chesapeake – 16, Newfield – 13 and XTO has 10. You can see from the map above that operators are drilling all over the western half of Oklahoma. However, there are a couple of plays defined. The SCOOP (South Central Oklahoma Oil Provence) is a play coined by Continental Resources. They seem to be mostly focused on the south central part of the state and are focused on both the Woodford and Springer formations. Newfield Exploration has coined the term Stack Play in the western Anadarko basin. They are active in several locations in Western Oklahoma and also appear to be targeting both the Woodford and the Mississippian. Sandridge is currently the most active operator in Oklahoma and they are focused almost entirely on the northwest part of the basin near the Kansas line. They are predominantly targeting the Mississippian Lime with a bit of Woodford shale which would be thinning this far up on the basin shelf. It is a great time to be in the industry especially in Oklahoma where existing infrastructure, pooling laws, multiple formations and new technology make for an exciting place to drill for oil and gas. How did the overpressured gas well turn out? We were able to log and case it with no additional incidents. It turned it into a really nice well. John Fierstien is the Director of Data Inventory. He has worked as a geologist for several E&P companies and as someone who has been helping to create some of the best tools for geologists and geophysicists to help them find oil and gas. He received his Bachelor of Science in Biology and Geology from Central Michigan University and his Master of Science in Geology from the University of Pittsburgh.